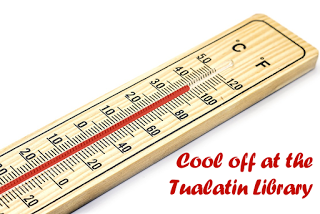 With the high temperatures forecast for this weekend, the Tualatin Public Library will extend hours on Saturday June 4 and Sunday June 5 until 8pm to serve as a cooling center. The Hillsboro Public Library and City of Hillsboro are also offering 4 cooling centers for the weekend. The National Weather Service has issued a heat advisory for the Portland-metro area through Sunday night, with forecasted highs of 100 degrees. While Tualatin is extending hours this weekend, you can also find a cool place to visit at any of the other WCCLS libraries. Contact your local library with questions about hours and locations. For more information on beating the heat, and to learn about other cooling centers in Washington county, visit the Washington County website.